This form of larceny is governed by Massachusetts General Laws Chapter 266 Section 25. What's the difference between this crime and the general crime of Larceny By Stealing? The answer is that the property which is stolen, must be stolen from the physical person of the true owner, or from the owner's immediate area of control, while in the victim's presence. In essence, a fourth element is added to the three elements necessary to prove Larceny By Stealing. 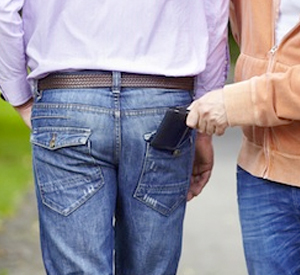 The easiest example of larceny by stealing from the person is pick pocketing (as long as no force or threat or force is used - then the charge becomes robbery. If you visit our Robbery Page, you will see that the major difference between these two crimes is that a robbery conviction can result in a potential sentence of life in prison, unlike larceny from the person, which allows a judge to impose a maximum sentence of 5 years in state prison. Another major distinction with this crime, is that the property's value is immaterial to the punishment options. A defendant convicted of larceny by stealing from the person can receive a maximum sentence of 5 years in state prison or up to 2 years in a county jail. If the crime victim is age 65 or older, the punishment is increased for a second offense to a mandatory minimum of 2 years in prison, and a judge cannot reduce the sentence until at least one year has been completed. Most charges of Larceny By Stealing From The Person are tried in the District Courts, not Superior. Hiring a talented Massachusetts Larceny Defense Lawyer is key to defending these charges successfully. If you or someone you know has been charged with of larceny by stealing from the person or any other type of Massachusetts theft crime, you will need to contact a Massachusetts criminal defense lawyer immediately. Call us 24 hours a day, seven days a week at either Ph. : (781) 320-0062 or Ph. : (617) 285-3600, or email our office for a free initial consultation. Whatever you do, do not hire an attorney based upon the lowest fee you receive. In the legal profession as in any profession, "you get what you pay for." If the attorney defending you is not very experienced in handling these types of cases, you will very likely end up with a less than desirable legal outcome. Don't make that mistake. Call us or contact us by email now.